They came to discuss–and eat–Wisconsin fish. And when they went their separate ways at the end of the day, new ideas had been exchanged and burgeoning new partnerships had been formed. That’s the nutshell story of the inaugural Eat Wisconsin Fish Summit, hosted by Wisconsin Sea Grant Jan. 13 in Sheboygan. The group of 63 attendees—that’s more than the 50 organizers had initially hoped to attract—included a wide array of interests: fish farmers, chefs, retailers, commercial fishers and local food enthusiasts, all of whom convened to learn about the ever-growing movement to support and eat locally caught and raised fish. Currently, more than 90 percent of the seafood consumed in the United States is imported from other countries. “We had a lot of deep discussion and it was great because of the mix of people we had,” said Kathy Kline, Wisconsin Sea Grant education outreach specialist and one of the event’s primary organizers. The panel discussions in particular connected groups that traditionally haven’t spoken to each other much, like local fish farmers and chefs. And, in at least one case, gave voice to one that’s rarely heard. Some of the information shared surprised the summit attendees. One new aspect of Wisconsin Sea Grant’s Eat Wisconsin Fish campaign to arise from the summit could be working with Wisconsin’s farm-to-school program. The program works to connect local food producers with Wisconsin school districts, and there was interest at the summit to pilot an effort to incorporate locally caught or produced fish into lunches served at Wisconsin elementary and middle-school cafeterias. At least one of the local seafood producers in attendance scored an extra benefit. Dairyland Shrimp, a shrimp farm located in Westby, Wisc., was able to use the event to test-drive methods of shipping its product to customers. 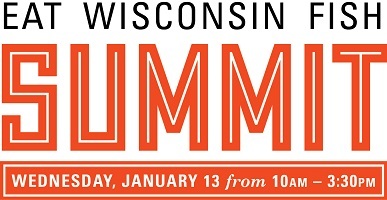 The Eat Wisconsin Fish Summit was funded by a Buy Local, Buy Wisconsin grant awarded by the state’s Department of Agriculture, Trade and Consumer Protection. It was scheduled to coincide with the annual Wisconsin Local Food Summit, also held in Sheboygan, to synergize audiences interested in supporting local food. 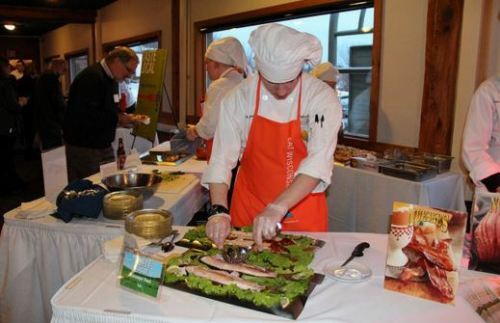 Kline said she hopes the summit can continue in the future, and she would also like to work more with culinary schools like the Lakeshore Culinary Institute, which hosted a Taste Local reception following the reception that featured Wisconsin fish, produce, cheese and beverages. The students prepared the food for the reception and performed live cooking demonstrations for the guests. For more on the Eat Wisconsin Fish campaign, visit eatwisconsinfish.org.